I pulled into the lot, parked, and checked my watch. Too early to go to my meeting. If I dallied for a few minutes, I could cruise into the workshop just before it started and avoid the awkwardness of meeting a roomful of strangers. I scrolled through a few emails. Rummaged through my purse. Sorted receipts. Delayed as long as possible. Finally, I made my way inside, pasted on a smile I didn’t feel and looked for a free chair – preferably close to the rear of the room, a place to be invisible in the crowd. Other introverts beat me to the back row but there was one place left on the end of a row near the front. A beautiful, well-put-together woman was in the next seat. I groaned inwardly for I felt shabby and rumpled beside her. Her invitation put me completely at ease. My tension and fear evaporated in an instant. I felt a part of the group, despite the multitude of unfamiliar faces. Her gracious welcome eased what could’ve been a very difficult weekend. Her first sweet welcome hangs in my mind. “I want to be your friend,” she’d said and proceeded to act on her intentions. Her example is a model I hope I remember and one we, in the body of Christ, would do well to emulate. Don’t just make a friend, be a friend. Imagine the impact if we said—and meant—those words to people who feel estranged and alone. Would they tarry a bit? Might they long to know what makes us different? Unfortunately, my tendency is to greet the people I know. It’s an act of discipline to look for those I don’t know. I try to greet strangers with a smile and a quick introduction. Sometimes I include a few get-acquainted questions. Never have I greeted a stranger, welcomed them, and offered friendship with follow-through to show I meant it, in the church building or outside it. If we’re honest, many of us are a lot like me. Our lives are so full there’s barely room for those we love, much less the new people Jesus sends our way. Is this what Jesus intended when He said to love your neighbor as you love yourself? I hate to admit it because it requires change on my part, but I don’t think so. Love includes a smile and a greeting, but it’s much deeper, longer lasting than a mere hello. It’s far bigger than we realize. It scares me to say this, but the kind of love Jesus commanded is a long-haul commitment, even when it’s not romantic love. Imagine churches in which we arrived at services with a “Sit with me; I want to be your friend” mentality. Imagine if we meant what we said to strangers and followed up with a phone call and an invitation. Life would be different. Fuller. Richer. Consider what would happen if we took that same let-me-be-your-friend, love-you-no-matter-what determination outside the walls of the church meeting place. 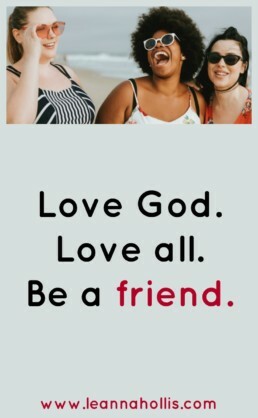 If we adopted the royal law of our King, (James 2:8) to love our neighbor in the same way we love ourselves, strangers would become friends and our lives would be better for it. Love God. Love all. It’s the royal law of our King so let’s reach out and love someone today.